The Walsall Kobar friendship committee exists to develop friendship and twinning links between Walsall and Kobar in Palestine. It aims to promote and support the development of such friendship links and to enable individuals and groups taking part to learn from each other’s experiences. Israel continues to persecute the people of Palestine. The assault by Israel on Gaza and other events such as continued building of settlements, restriction of movement and eviction of Palestinians from their family homes, all serve to demonstrate the continuing need for support to Palestine and its people. Kobar is a small town on the outskirts north of Ramallah in West Bank of Palestine. The town has a population of about 4,500 people and contains two Secondary schools and two Primary schools. The Walsall - Kobar Friendship Association is now in its eighth year and has been active in extending links with Kobar and organising exchange visits in each direction. Visitors from Palestine have toured half a dozen Walsall schools, giving presentations to classes and talking with students and staff. Delegations have been received by the Mayor of Walsall on three occasions and we have had discussions with councillors from all three main political parties here as well as holding meetings with trade unions, churches and mosques in the town. Work here has included fundraising and publicising the plight of Palestinians, sponsorship of students, helping the needy and destitute, communication with Kobar Women’s Association and assisting with the increase of trade with the outside world. Our awareness - raising work has included the showing of several films about Palestine. Organised events have included public meetings with visiting speakers and fundraising events such as a Charity Bazaar and a Garden Parties. Money is being used, among other things, to buy computers and other equipment for schools in Kobar to link with schools in Walsall. WKFA has also helped raise thousands of pounds for the building of a much needed Mosque / Community Centre. Other work includes continuing to assist the Women’s Co-operative in increasing trade in Palestinian handicrafts they have made. Walsall Kobar Friendship Association hopes in the longer term Walsall can formally twin with Kobar. For a summary of our activities in 2014, click here. 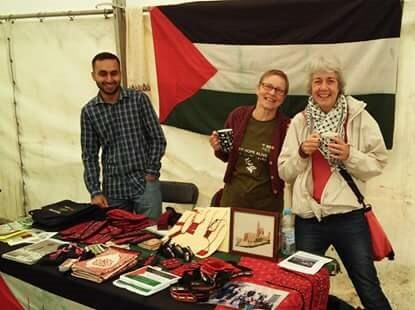 We work with other groups, one of which is Sumud Palestine, based in North Staffs. 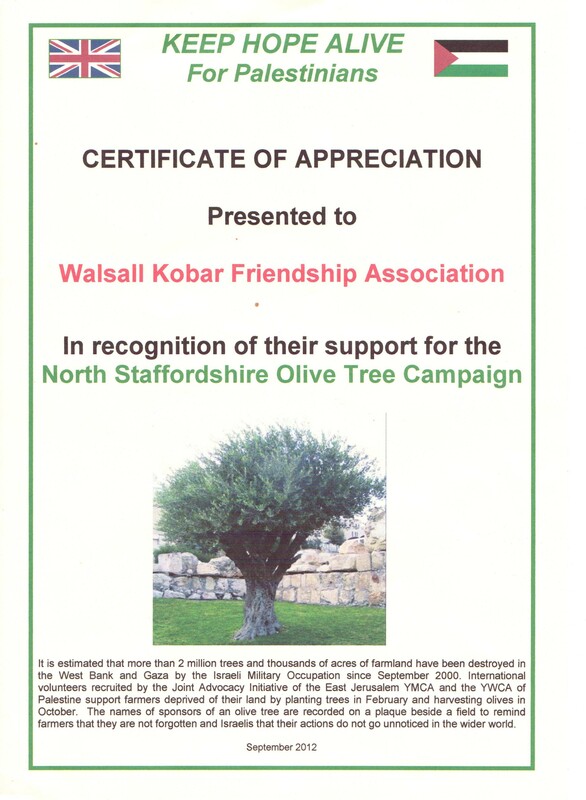 Members of Walsall Kobar Friendship group recently donated to buy trees which will be planted in Palestine. We were presented with a certificate. Click here to view.